"We don't say we're the best, our customers do!" ​Welcome To Daytona's Best Pizza. Daily fresh dough oven-baked pizza with Stavro's selected tomato sauce, cheese and toppings. Enjoy our family-friendly sit down restaurant or order your pizza to go and enjoy it at home or in your beachside condo. We offer hot and cold oven grinders, subs and hoagies. Looking for pasta? Order up our baked Italian pasta dishes or spaghetti. The Original Stavro's Pizza House is open 7 days a week. Check out our on-line Take out menu and call now to place your order. Or, come visit us at our Beach Street location in downtown Daytona Beach. 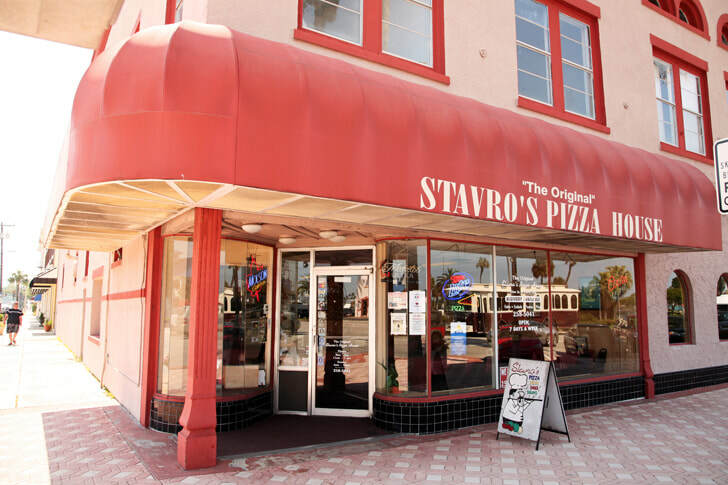 ​The Original Stavro's Pizza House is located on Beach Street in beautiful downtown Daytona Beach. Across the river from Jackie Robinson Memorial Baseball Park & The Daytona Beach Court House and Kitty corner from Halifax River Yacht Club. We are walking distance to City Island (home of City Island Tennis Center, Daytona Beach Regional Library, Halifax Rowing Association, Daytona Beach Area Convention & Visitor Bureau, and next door to the Halifax Historical Museum. ©2019 - The Original Stavro's Pizza House. All Rights Reserved.